We've already covered Meld from a beginner's point of view (including the tool's installation part), and we've also covered some tips/tricks that are primarily aimed at intermediate Meld users. If you remember, in the beginner's tutorial, we mentioned that Meld can be used to compare both files as well as directories. 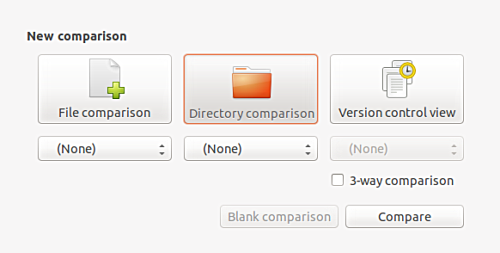 Now that we've already covered file comparison, it's time to discuss the tool's directory comparison feature. But before we do that it'd be worth sharing that all the instructions and examples presented in this tutorial have been tested on Ubuntu 14.04 and the Meld version we've used is 3.14.2. 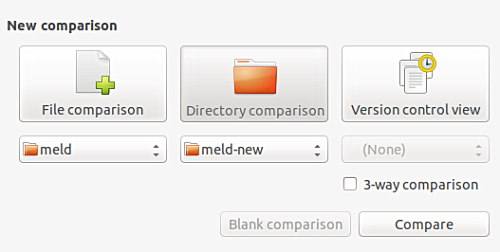 To compare two directories using Meld, launch the tool and select the Directory comparison option. Of course, these being directories, they are displayed as side-by-side trees. And as you can see in the screenshot above, the differences - whether it's a new file or a changed file - are highlighted in different colors. 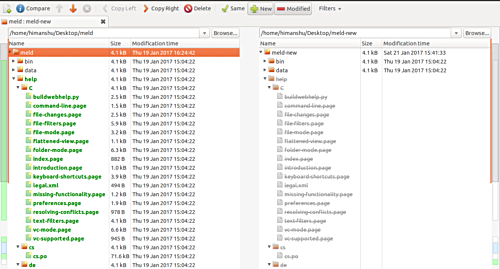 According to Meld's official documentation, each file or folder that you see in the comparison area of the window has a state of its own. A state basically reveals how a particular file/folder is different from the corresponding entry in the other directory. 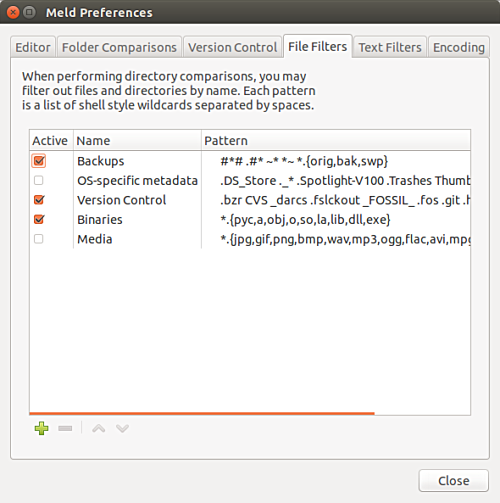 The following table - taken from the tool's website - explains in details the folder comparison states in Meld. The file/folder is the same across all compared folders. 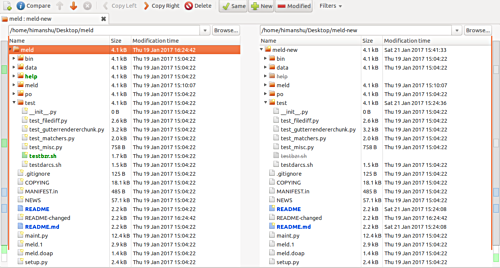 These files are different across folders, but once text filters are applied, these files become identical. These files differ between the folders being compared. This file/folder exists in this folder, but not in the others. This file/folder doesn't exist in this folder, but does in one of the others. When comparing this file, an error occurred. The most common error causes are file permissions (i.e., Meld was not allowed to open the file) and filename encoding errors. By default, Meld shows all the contents of the folders being compared, even if they are same (meaning there's no difference between them). However, you can ask the tool to not display these files/directories by clicking the Same button in the toolbar - the click should disable this button. So you can see that only the differences between the two directories (new and modified files) are shown now. Similarly, if you disable the New button, only the modified files will be displayed. So basically, you can use these buttons to customize what kind of changes are displayed by Meld while comparing two directories. Coming to the changes, you can hop from one change to another using the up and down arrow keys that sit above the display area in the tool's window, and to open two files for side-by-side comparison, you can either double click the name of any of the files, or click the Compare button that sits beside the arrows. Note 1: If you observe closely, there are bars on the left and right-hand sides of the display area in Meld window. These bars basically provide "a simple coloured summary of the comparison results." For each differing file or folder, there's a small colored section in these bars. You can click any such section to directly jump to that place in the comparison area. For example, select a file or folder in the left pane and click the Copy Right button to make the corresponding entry in the right pane exactly same. Moving on, there's a Filters drop-down menu that sits just next to the Same, New, and Modified trio of buttons. Here you can select/deselect file types to tell Meld whether or not to show these kind of files/folders in the display area during a directory comparison. The official documentation explains the entries in this menu as "patterns of filenames that will not be looked at when performing a folder comparison." The entries in the list include backups, OS-specific metadata, version control, binaries, and media. The aforementioned menu is also accessible by heading to View->File Filters. You can add new elements to this menu (as well as remove existing ones if you want) by going to Edit->Preferences->File Filters. Finally, an important point worth knowing about Meld is that the case of a file's name plays an important part as comparison is case sensitive by default. This means that, for example, the files README, readme and ReadMe would all be treated by the tool as different files. Thankfully, however, Meld also provides you a way to turn off this feature. 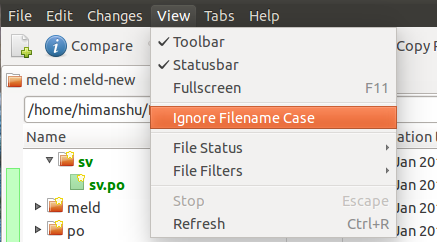 All you have to do is to head to the View menu and then select the Ignore Filename Case option. As you'd agree, directory comparison using Meld isn't difficult - in fact I'd say it's pretty easy. The only area that might require time to learn is creating file filters, but that's not to say you should never learn it. Obviously, it all depends on what your requirement is. Oh, and yes, you can even compare three directories using Meld, a feature that you can access by clicking the 3-way comparison box when you choose the directories that you want to compare. We didn't discuss the feature in this article, but definitely will in one of our future articles. 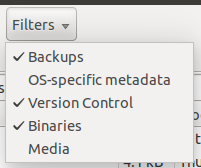 I am confused about the "File Filters". Are the filters listed ones that we want to compare or onces that we want to skip. This may sound dumb but it goes with my first question. Does the checkmark indicate that filter (whatever it does) is turned on or off. I'simply trying to find all the "*.cs" files in a C# project were changed. Thanks for any clarification.